names. Full support for QNames is planned for a later release. I don't know if this is just happening for me but I find a very minor but persistent cosmetic bug. 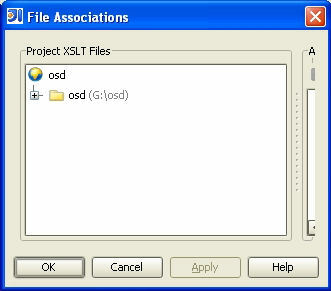 Whenever I click on the project level File Associations menu it sizes itself so that you cannot see the associated files list, if you increase the size it will simply revert back to its previous state if you try to go there again after ok-ing your changes. As I said, hardly a showstopper but I'd be interested to know if I was the only one seeing this problem. thanks for the feedback. This is actually a known problem but I can only reproduce this once after installing the plugin - after resizing the dialog it remembers its size when re-opening it and the right pane comes up with a reasonable size then. Thanks for the quick response Sascha. It sounds like a bit of a challenge to fix this one. At least I know it's not something to do with my settings now though. please try the latest version (1.3.3) that is available for IDEA builds >= 4129.